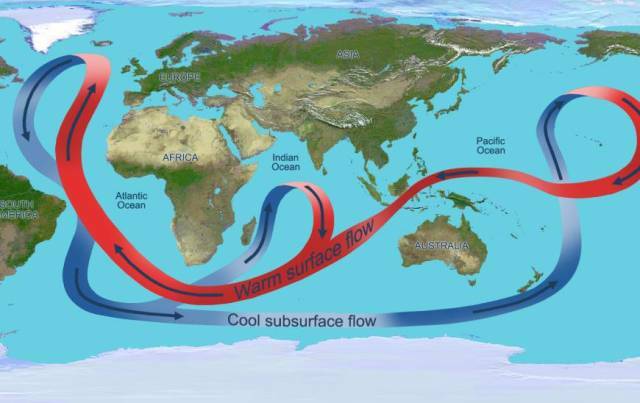 "Climate models don't do a great job of simulating global ocean circulation because they can't simulate the small scales that are important for deep ocean mixing," said study co-author Ryan Holmes, a graduate student at Stanford's School of Earth, Energy & Environmental Sciences. To better understand mixing in the tropical oceans, James Moum, a professor of physical oceanography at Oregon State University, organized a five-week research cruise in the equatorial Pacific and invited Holmes, who had been investigating equatorial mixing in ocean models for his PhD dissertation. The group brought along an experimental sensor called a kai-pod that is designed to measure turbulence all the way to the seafloor 4,000 meters, or nearly 2.5 miles, below the surface. "Upwelling requires mixing of waters with different temperatures and therefore different densities. What we measured using the kai-pod is the turbulence that generates this mixing," Holmes said. "This marked the first time that anyone had ever measured mixing to these depths on the equator." "This was the first time that anyone had observed turbulence over smooth topography that was as strong as that found over rough topography," Holmes said. To understand what was happening, Moum enlisted the help of Leif Thomas, an expert in the physics of ocean circulation at Stanford and Holmes' graduate advisor. Using computer models, Thomas and Holmes were able to simulate how winds blowing across the ocean surface can generate "internal waves" that propagate vertically down through the ocean depths and transport the energy required to mix waters at the seafloor. However, their model was not able to reproduce the observed abyssal mixing: Instead of generating turbulence, the internal waves ping-ponged between two vertical bands of water on either side of the equator and the smooth seafloor without breaking. "These waves in the model were trapped to the equator between two vertical bands that act like funhouse mirrors bouncing light rays back and forth," said Thomas, an associate professor in the Department of Earth System Science. The Stanford scientists were stumped – until Thomas had the idea to incorporate the horizontal component of Earth's spin, conventionally disregarded in ocean models, into their simulation. Thomas recalled from his previous studies that the horizontal spin of strong currents, such as the Gulf Stream, could cause internal waves in the mid-latitudes to amplify and break when they reflect off the bottom of the ocean. "It occurred to me that internal waves at the equator, where the effects of the horizontal component of Earth's spin are most pronounced, could experience an analogous behavior when the waves reflect off the seafloor," Thomas said. "With this in mind, I suggested to Ryan to explore this idea." Thomas' hunch proved correct. The Stanford scientists found that in the equatorial waters they were modeling, Earth's rotation imparts a subtle vertical motion to moving objects. This nudge is enough to disrupt the reflection of internal waves, trapping them near the ocean bottom and focusing their energy to generate turbulence. "We included this horizontal component and found that it changed the physics of waves in the deep equatorial oceans, potentially causing them to break and drive turbulence and mixing," Holmes said. "Scientists have long known that the equatorial upper ocean is critical for the physics of interannual variations in climate such as El Niño," he said. "Our new study suggests the abyssal ocean at the equator could impact the climate system on much longer timescales."